Zellars Village Inn offers guests a wide variety of room types with all the comforts of home. We are having fun here at Our Upper Michigan hotel and motel provides visitors with clean, comfortable and spacious rooms that range from a double queen standard to our Green Bay Packer's suite shown to the right. Each unit provides you with a phone, air conditioning, tub / shower, free coffee, and cable TV. Some of our rooms have additional features, so please visit our Upper Michigan lodging page and galleries for more information. Z's will help you make your stay enjoyable and fun. 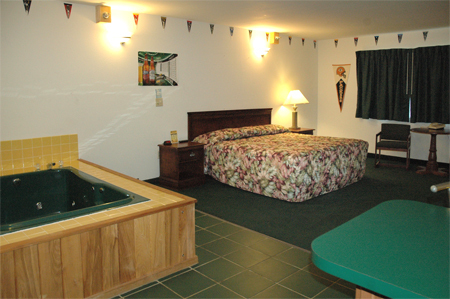 www.zellarsvillageinn.net has a variety of Upper Michigan lodging room types to accommodate your UP vacation needs. Open year-round, Z's welcomes snowmobilers, hunters, fishing groups, families, organizations and all who seek adventure here in Michigan's beautiful Upper Peninsula. Visit our great area attractions: The Tahquamenon Falls, Great Lakes Shipwreck Museum, Oswald's Bear Ranch, Crisp Point Lighthouse, Tahquamenon Logging Museum, Tahquamenon Falls Riverboat Tours, and the Seney Wildlife Refuge. Click or onto the banner to the right to view our online video on facebook. We welcome you and your family to visit the Zellar's Restaurant of Newberry, MI. The staff is proffessional and pleasant. Our menu offers a wide variety of tasty breakfasts, lunches and dinners. We also have menu items for seniors, vegetarians, children and those with hearty appetites. We are open year-round and seven days a week. We also have weekday specials, please make sure to visit our Specials page for details. We also provide events and catering services. "All Under One Roof." Enjoy our home cooked food and fresh pies. 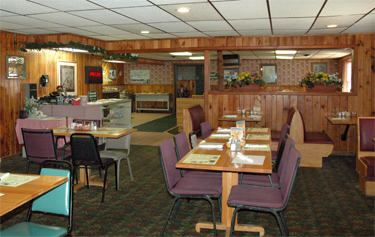 Zellar's Village Inn has a great variety of menu items, something for everyone to enjoy. Z's Lounge ignites the night life in Newberry, Michigan. Our Upper Michigan lounge is open from noon to 2 am. 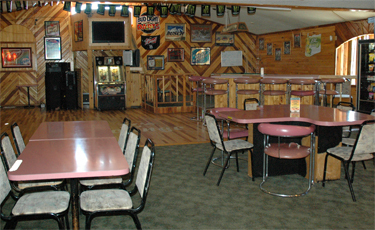 Zellars Lounge has a full bar and offers a large variety of specialty drinks and beer. Feel free to have a drink and eat at the Lounge. From 4 pm to 10 pm, you can order from the regular restaurant menu. Z's Lounge also has entertainment on specific days of the week, along with live bands. Please check out our Z's Entertainment page for details. Visit our Lounge page to learn more about our fantastic Newberry, MI bar where residents and visitors alike come to relax and have fun. Notice: Our pool and hot tub are temporarily closed until further notice. Come and take a splash in our large indoor heated pool, hot tub and sauna. Our pool room is beautifully decorated with the rustic decor that Upper Michigan is all about. Great for vacationers who need to relax and unwind from traveling. 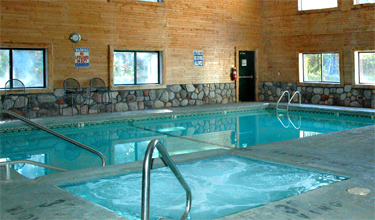 All our lodging guests can enjoy the use of our indoor heated pool and hot tub. Zellar's can help you make your next event extra special. We have a great banquet room for onsite events. We also have our Upper Michigan Catering services for onsite or at a site of your choosing. Please let us help you make your next event extraordinary!